Chicken, Duck, Turkey, Guinea, & Goose! 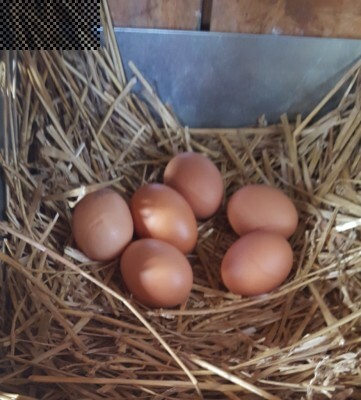 Only the chickens produce and a regular schedule year round, so be sure to ask what is currently available! 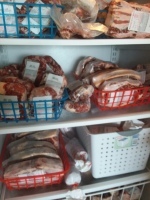 Our pasture raised meats (beef, pork, chicken, turkey, lamb, and goat) are butcherd by several local butchers that are inspected by the state or the USDA during the entire processing task. The meat is then flash frozen to preserve the cell walls of the meat, ensuring texture and moisture remains within the cells. What this means to the customer is flavorful juicy meat. The flavor, the nutrients,and the texture of our meat retains farm-fresh quality. 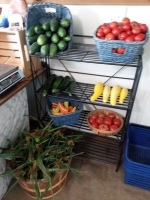 A variety of seasonal produce is available during the warmer months. 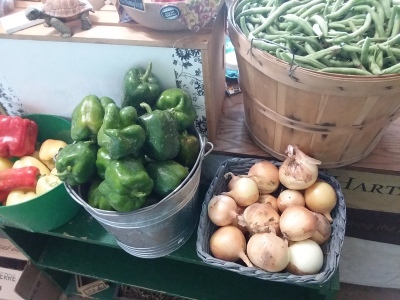 Items include: tomatoes, onions, potatoes, peppers, squash, cucumbers, beans, and more! Hartman Heimstytte produces jams, jellies, and fruit butters with many of the fruits that are found on our farm. To make sure that we are offering the freshest product possible, we freeze fresh fruits in the growing season so that we can keep fresh stock on the shelves at all times! Various baked goods are available at the farm store throughout the year. These items rotate during the season, so if you have a favorite and would like to have it for a special occasion, please pre order! Angel food cakes, fruit pies, cream pies, cookies, cupcakes, and fruit infused cakes. Homemade soaps made with the milk from the goats here on our farm. Most are scented with essential oils and those scented with fragrance oils are paraben free! 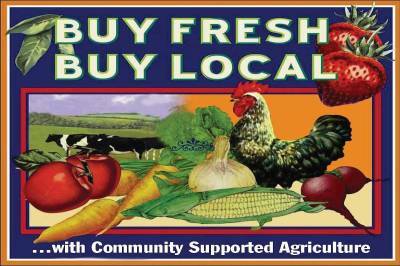 Our convenient CSA membership allows ease, flexibility, and cost effectiveness for the member! Members choose from 3, 6, or 12 month commitments and their level of commitment ($50-$300/ month). Members receive a 20% spending bonus each month and, unlike other CSA programs, the MEMBER chooses the items that they will receive in their share! Several local artisans have shared their treasures with us here at Hartman Heimstytte! 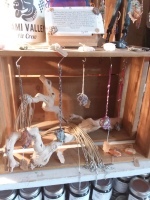 Offerings include handcrafted jewlery, soy candles, and custom crafts!